Buses depart daily every 8-15 minutes during operating hours. Travel early, late or off-season to enjoy a less-crowded experience on the bus. Make full use of your ticket by travelling on the bus in the evening hours to see the city lit up at night and to get some superb sunset views. 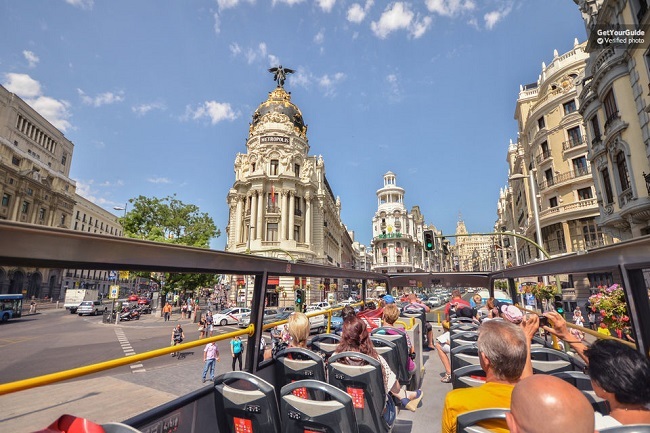 We are comparing Madrid Hop-On Hop-Off City Sightseeing Bus Tour Prices from leading ticket suppliers and Try to find you Cheap tickets prices on the market. A city sightseeing open-top double-decker bus tour taking you around the most scenic, iconic, and famous sites in Madrid. This bus tour allows you to hop-on and hop-off at 37 stops on 2 interconnecting routes around the city as many times as you would like throughout the day/night. This method of transport is made for people who want the comfort of easily getting from A-B without any time restrictions on how long they can spend at any one venue – The buses running every 8-15minutes. Pass by the top sites including The Royal Palace, The Temple of Debod, Gran Via, Plaza de Espana and many more points of interest with the chance to get off the bus and explore the top museums and tourist attractions at your own pace before re-boarding at a later time. The modern and comfortable buses are fitted with a state of the art sound system allowing visitors to hear all about the sites they are passing. There's wifi onboard so visitors can check maps and plan where they want to go next, and of course post the selfies onto social media, and when batteries start to run flat you'll find USB charging points at each seat. Choose to sit upstairs or downstairs – Upstairs has the best views but downstairs boasts air-conditioning to keep you cool and comfortable as you ride around the city. This hop-on-hop-off bus tour is a great way to get an overview of the city of Madrid. Ideal for travellers who don't have much time and/or don't want to walk far. History fans will enjoy Route 1 which drives you down the iconic Gran Via and past the oldest buildings and monuments in Madrid, including the top museums. For visitors interested in modern architecture, hop on Line 2 which introduces you to some of Madrid's newest iconic buildings. Suitable for adults travelling alone as well as families. Your Experience With Madrid Hop-On Hop-Off City Sightseeing Bus Tour? Discover both the historical and modern sites in Madrid on the interconnecting Blue and Green lines which stop at 37 destinations around the city. The bus will stop at, or very near, iconic sites such as The Royal Palace, The Cathedral, The Temple of Debod, Gran Via, Real Madrid FC football stadium and many, many more top attractions. Listen to audio commentary via headphones to learn more about the sites you are passing and the city of Madrid. There are 14 languages to choose from - English, Spanish, Catalan, Gallego, Euskera, French, German, Italian, Portuguese, Dutch, Russian, Chinese, Japanese, and Arabic. Hop on or hop-off the bus as many times as you would like with your 1 or 2 day ticket. Alternatively, stay on the bus for the entire 60-85minute journey as you relax and watch the city pass by. What Madrid Hop-On Hop-Off City Sightseeing Bus Tour Includes? Unlimited 1 or 2 day access to 37 stops on 2 routes around Madrid, allowing you to take in the top tourist sites and attractions around the city in comfort and with ease. You will receive a map of the city, guidebook, and discount vouchers for selected restaurants, bars and shops when you board. Audio commentary is delivered in 14 languages via headphones enabling you to learn more about the sites that you pass, there's even a kids channel to keep the little ones entertained. Unbiased comparison of Madrid's Hop-on Hop-off Bus Tours operators(MADRID HOP-ON HOP-OFF CITY BUS TOUR VS EXPRESS TOLEDO BUS TOUR VS PANORAMIC MADRID SIGHTSEEING TOUR) based extensive research, Tripindicator team came up with comprehensive recommendations about Madrid City Bus tours which helps you choosing Right Madrid Sightseeing Bus Tour for your travel. Unbiased comparison of Madrid's City Passes(MADRID ART WALK CARD VS MADRID CARD VS IVENTURE PASS VS TOLEDO) based extensive research, Tripindicator team came up with comprehensive recommendations which helps you choosing Best Madrid Skip-line attractions pass for your travel. Only printed tickets are accepted. Plan an itinerary and choose which stops/route you want to take ahead of time. Free travel for children aged 0-6 years. Travelers Reviews about Madrid Hop-On Hop-Off City Sightseeing Bus Tour? People are talking about this tour on TripAdvisor, Getyourguide and Viator and are are very happy with it, saying it's fabulous value for money. Travellers say this hop-on-hop-off bus tour is a great way to get an overview of the city of Madrid and that it was a great use of their time. People on Viator say it's a great way to get around, it's fun, and that they would highly recommend it. Some people had problems due to not having a printed ticket with them when trying to board. Yes, this tour is suitable for people with limited mobility. Buses are fitted with an automatic access ramp as well as an extended ramp. Onboard there's reserved wheelchair space with safety clamps and harnesses. Only printed tickets are accepted onboard the bus. When booking through Getyourguide you can cancel 24 hours in advance and receive a full refund. When booking with Viator you must cancel atleast 7 days in advance to receive a full refund, or 3-6 days in advance to receive a 50% refund. Be sure to print your ticket, e-ticket's are NOT accepted onboard. If you do need to exchange your e-ticket for a printed ticket and cannot find somewhere else to print you can go to the ticket office at Julia Travel Office - C/ San Nicolas, 15 (Plaza de Ramales), 28013 Madrid who will do it for you. Some stops might be cancelled without advanced warning due to building works, traffic jams etc. You can board the bus at any of the 37 stops around the city.